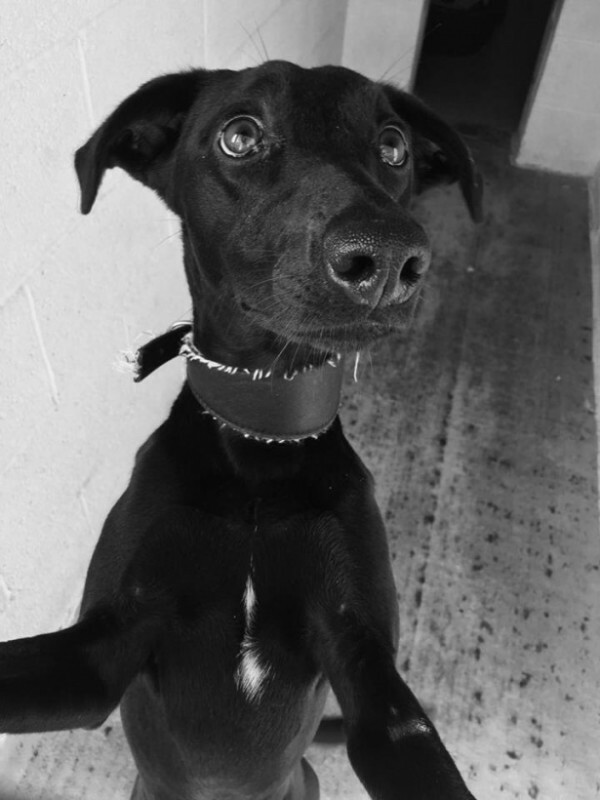 Jasmine is a beautiful 8-10 month old Whippet cross (probably Labrador, but she is a small/petite girl) who is looking for a VERY active home where she will be given the exercise and mental stimulation she needs and loves as she never stops!! Jasmine is now in a foster home living with another young energetic dog, and could happily live with other dogs, ideally young dogs who will play/keep up with her! She will chase cats/small furries. She needs to learn some more boundaries – currently she thinks furniture is an obstacle course for her to play on…! She is clean in the house, and will let you know when she needs to go out, and is also OK to be left for short periods (which can be built up, but she will become bored quite quickly). She is very bright, eager and keen to learn, so will be fantastic to train. Jasmine is very bouncy, and would be too much for children under 10/12 years old. She travels well in the car, and is learning to walk nicely on the lead (she has not yet been off lead!). She is an absolute cracker who would be fantastic at agility/flyball type activities – she has tons of potential! !